Adrián Beltré Pérez (born April 7, 1979) is a Dominican professional baseball third baseman for the Texas Rangers of Major League Baseball (MLB). He is known for his prodigious defensive and offensive capabilities, being selected four times each for the Rawlings Gold Glove Award, Silver Slugger Award, and MLB All-Star Game. He bats and throws right-handed. His signature home run (HR) swing includes a drop to one knee when connecting with a breaking ball. He is also known for his dislike of anyone touching the top of his head (which Rangers teammate Elvis Andrus does frequently, much to Beltre's disdain). The Los Angeles Dodgers signed Beltré as an amateur free agent from the Dominican Republic in 1994. The youngest player in the National League when he made his MLB debut for the Dodgers in 1998, Beltré has also played for the Seattle Mariners and Boston Red Sox. In 2004, he led MLB in HR, in doubles in 2010, and in hits in 2013. He is 25th all-time in defensive Wins Above Replacement (23.2), first among active players, and ninth all-time among third basemen in total zone runs (114). Beltré was signed out of the Dominican Republic by the Los Angeles Dodgers in 1994 by Ralph Avila, the grandfather of Detroit Tigers all-star Catcher Alex Avila. Beltré attended Liceo Maximo Gomez High School. In 1994, while working out at Campo Las Palmas, a Los Angeles Dodgers facility, he was spotted by scouts Ralph Avila and Pablo Peguero. Though only 15 and weighing just 130 pounds, he had a quick swing and live throwing arm. On the insistence of Avila and Peguero, the Dodgers signed Beltré in July. He received a $23,000 bonus. When it was revealed that Beltré had signed his initial contract at the age of 15, commissioner Bud Selig suspended the Dodgers' scouting operations in the Dominican Republic for a year, because signing a player at that age was prevented under MLB rules. After being called up to the majors from the then Dodgers Double-A affiliate San Antonio Missions, Beltré made his major league debut on June 24, 1998, starting at third base in the first game of an interleague series against the Anaheim Angels. At the time, he was the youngest player in the National League. During his first at-bat, Beltré smashed a two-out RBI double off Angels starter Chuck Finley into left field to score Paul Konerko from second base to tie the game. He would hit his first home run six days later against Texas Rangers starter Rick Helling. At the end of the 1998 season, Beltré would finish with 13 errors at third base while batting .215 with seven home runs. Beltré hit .265 while hitting 18 homers a year (on average). From 1999 through 2003, Beltré also started 710 games at third base (out of 810 games played) averaging a .948 fielding percentage. In 2004, Beltré had a breakout season, leading the MLB with 48 home runs, had a .334 batting average, and got 200 hits. He was honored with a Silver Slugger Award and the Babe Ruth Home Run Award while finishing second in the NL MVP voting. 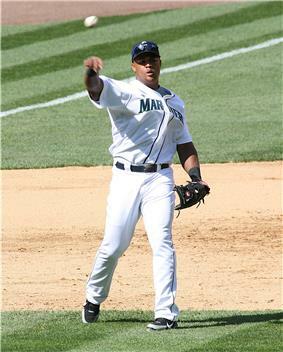 Beltré was signed by the Seattle Mariners as a free agent before the 2005 season to a five-year, $64 million deal. Regressing to his pre-2004 form, he batted just .255 with 19 home runs and 87 RBIs. Manager Mike Hargrove did not give up hope on Beltré, saying, "I think it's a season that, personally, he's disappointed in. I think it was a year that he will improve on the longer he's here and the longer he's in the American League." After batting .167 through April 10, Ted Miller of the Seattle Post-Intelligencer wrote that Beltré may become one of the Mariners' greatest busts. By June 5, 2006, Beltré's batting average was slowly improving, from .109 on April 16 to .236 at that time. After hitting his first home run in April, and his second later that month, Beltré's hitting began to improve. Though it was not a great season for Beltré, it was statistically his best as a Mariner. He hit .276, had 26 home runs, and had 99 RBIs. He also had a career high 41 doubles. He also was honored with a Fielding Bible Award for being the top MLB defensive third baseman during the year. On September 1, 2008, Beltré hit for the cycle, at the Rangers Ballpark in Arlington, becoming the fourth Mariner to do so. Arizona Diamondbacks shortstop Stephen Drew hit for the cycle that day as well, the first time two players had done so since 1920. He won his second Fielding Bible Award for his defense that year. Beltré's decision not to wear a cup despite playing third base has been well-documented. This came back to hurt him on August 13, 2009, when he took a hard ground ball to the crotch. Although he stayed in for the remainder of the 14-inning victory, he was put on the DL after suffering bleeding in one of his testicles. In his first game back from the DL from that injury, teammate Ken Griffey Jr. conspired with those responsible for the Safeco Field PA system to have Beltré's at-bat intro music be the waltz from The Nutcracker Suite. Beltré batting for the Boston Red Sox in 2010. Beltré declared free agency on November 5, 2009. On January 7, 2010, Beltré signed a one-year, $9 million deal with the Boston Red Sox, which had a $5 million player option for 2011 with a $1 million buyout. Beltré led the Red Sox in batting average (.321) in 2010 and tied David Ortiz for the team lead in RBIs (102). He finished the year with 189 hits in 589 at-bats. He had 28 home runs and 84 runs scored. Beltré led the Majors in doubles, with 49 (also a career high). He also finished fourth in the AL in batting average, and was fifth in the AL in total bases (326) and slugging percentage (.553). He also had two stolen bases on the year, and finished ninth in the MVP voting. On defense, he tied for the AL lead in errors by a third baseman, with 19. Beltré was also partially responsible for the Red Sox injuries woes that year, as he had two separate collisions with outfielders Jacoby Ellsbury and Jeremy Hermida, breaking their ribs in both instances. On January 5, 2011, Beltré signed a five-year (2011–15), $80 million contract with a vesting option for $16 million for the 2016 season with the Texas Rangers. He was on the 2011 American League All-Star team. On July 22, Beltré strained his hamstring and was also placed on the DL. On September 4, Beltré hit a line single to right against the Boston Red Sox for his 2,000th career hit. On September 11, Beltré hit two home runs, including the 300th of his career, against the Oakland Athletics. In 2011, Beltré batted .296 with 32 home runs (5th in the AL). He was third in the American League in slugging percentage (.561), sixth in RBIs (105), and ninth in OPS (.892). Through 2011, he led all active third basemen in career putouts (1,660) and errors (235). He won his third Fielding Bible Award for his outstanding defense. On October 4, 2011, in an ALDS playoff game against the Tampa Bay Rays, Beltré became the sixth player—the first in a Division Series—to hit three home runs in a Major League playoff game. He added a fourth playoff home run in Game 5 of the 2011 World Series, when he went down to one knee chasing an outside curve ball from Chris Carpenter. He finished the postseason with 5 home runs and 9 RBI's. On November 1, 2011, Beltré was honored with the Gold Glove Award at third base for the 2011 season, the first by a Ranger third baseman since Buddy Bell's six-year run from 1979–1984. On November 2, 2011 he was awarded the Silver Slugger Award. Beltré once again proved to be one of the best third basemen in the league, being voted to the 2012 Major League Baseball All-Star Game on July 1, 2012 as a starter along with teammates Josh Hamilton and Mike Napoli. This was his third all-star game and third in a row dating back to 2010 with the Boston Red Sox. As of August 28, his numbers compiled are: .315 avg., 25 HR, 81 RBIs, and an .881 OPS. ^ Spousta, Tom (October 25, 2011). "Adrian Beltre's Unique Home Run Swing Set Up Rangers' Comeback". ^ Dayn Perry, "Do Players Perform Better in Contract Years? ", Baseball Between the Numbers: Why Everything You Know About the Game is Wrong, (New York, NY, Basic Books and Baseball Prospectus, 2005), p. 200–01. ^ a b c d e "Adrian Beltre Statistics and History". Baseball-Reference.com. Retrieved October 3, 2011. ^ At the following webpage, scroll down to "The Babe Ruth Homerun Award". "06 Fan Stories: Ultimate Babe Ruth Fans". BabeRuthCentral.com. Babe Ruth Central. Archived from the original on November 8, 2011. ^ "Beltre gets 5-year deal day after Sexson signs". ESPN.com. Associated Press. December 16, 2004. Retrieved March 2, 2015. ^ Miller, Ted (April 10, 2006). "Beltre on brink of being a bust". SeattlePI.com. Retrieved April 8, 2007. ^ Thiel, Art (July 23, 2006). "Slapstick home run livens up Safeco lore". Seattle Post Intelligencer. Retrieved March 2, 2015. ^ .> "September 1, 2008 Seattle Mariners at Texas Rangers Play by Play and Box Score". Baseball-Reference.com. ^ Street, Jim (September 2, 2008). "Beltre hits for cycle against Rangers". MLB.com. Retrieved March 2, 2015. ^ Street, Jim (February 24, 2008). "Beltre Giving it Another Go for the Gold". mlb.com. Retrieved February 24, 2008. ^ Spratt, Gerry (August 13, 2009). "UPDATE: Beltre could be out for season with testicle injury". Seattle Post Intelligencer. Retrieved March 2, 2015. ^ Baker, Geoff (August 13, 2009). "Adrian Beltre to DL, could be lost for season with injured testicle". Seattle Times. Retrieved March 2, 2015. ^ "Adrian Beltre could be out for the season with injured testicle". Associated Press. August 13, 2009. Retrieved August 13, 2009. ^ Baker, Geoff (September 1, 2009). "Los Angeles Angels at Seattle Mariners: 09/01 game thread". Seattle Times. Retrieved September 1, 2009. ^ Stone, Larry (October 5, 2009). "Beltre, Sweeney file for free agency". Seattle Times. Archived from the original on November 8, 2009. Retrieved October 5, 2009. ^ Ian Browne / MLB.com. "Beltre Boston-bound with deal complete". Mlb.mlb.com. Retrieved October 3, 2011. ^ "2010 Regular Season MLB Baseball 3B Fielding Statistics". ESPN. Retrieved October 15, 2011. ^ 1 hour, 20 minutes ago (September 30, 2011). "Beltre hits 3 homers in ALDS Game 4". yahoo.com. Retrieved October 4, 2011. ^ "Texas Rangers vs. Tampa Bay Rays – Recap – October 04, 2011". ESPN. October 4, 2011. Retrieved October 15, 2011. ^ "Adrian Beltre hits a home run off one knee during last night's game". October 24, 2011. ^ Durrett, Richard (November 1, 2011). "Adrian Beltre proud of third Gold Glove". ^ Schroeder, Scott (November 2, 2011). "2011 Silver Slugger Award Winners Includes Detroit Tigers' Alex Avila, Not Miguel Cabrera". ^ "baseball-reference.com". baseball-reference.com. Retrieved January 21, 2014. ^ Durrett, Richard (January 17, 2014). "ESPN Dallas". Espn.go.com. Retrieved January 21, 2014. ^ "Hitting for the Cycle The Cleat Report". The Cleat Report. Retrieved September 5, 2014. ^ "Adrian Beltre reels in fourth career Gold Glove | texasrangers.com: News". Texas.rangers.mlb.com. October 30, 2012. Retrieved January 21, 2014. ^ "Rangers’ Adrian Beltre named American League player of the week | Dallas Morning News". Rangersblog.dallasnews.com. July 8, 2013. Retrieved January 21, 2014. ^ "Hot-hitting Beltré wins AL Player of Month | MLB.com: News". Mlb.mlb.com. Retrieved January 21, 2014. ^ "Beltre belts 100th homer as a Ranger". Mlb.mlb.com. May 7, 2014. Retrieved August 27, 2014. ^ "Beltre raps 2,500th career hit". Mlb.mlb.com. June 24, 2014. Retrieved June 25, 2014. ^ "Rangers rework Beltre's deal, eliminate right to void 2016". ESPN.com. Associated Press. February 23, 2015. Retrieved February 24, 2015. ^ Sullivan, T.R. (February 23, 2015). "Rangers pick up Beltre's 2016 contract option". MLB.com. Retrieved February 24, 2015. ^ Goold, Derrick (October 30, 2008). "Albert Pujols, Yadier Molina snag Fielding awards". ^ "Molina, Wainwright nab Gold Gloves: Back-to-back awards for Cards catcher; hurler wins first". MLB.com. November 11, 2009. ^ "Molina honored with first Gold Glove: Catcher's long-recognized defense finally nabs top NL award". MLB.com. November 5, 2008. ^ a b "Molina earns 5th straight Gold Glove award". MLB.com via St. Louis Cardinals. October 30, 2012. Retrieved October 31, 2012. ^ "Molina captures second Platinum Glove Award". MLB.com via St. Louis Cardinals. November 10, 2012. Retrieved November 10, 2012. Platinum Glove Award at third base, 2011–12. Silver Slugger Award at third base: 2004, 2010, 2011, 2014. All-time hit leader by Dominican Republic native with 2,760 hits as of September 30, 2015. One of five players to hit 100 home runs with three different teams. 4th player in MLB history to hit for the cycle three times (once as a Mariner and twice as a Ranger) and currently the only player to do so in the same ballpark (Globe Life Park in Arlington). During the last week of the season, and the Rangers' run towards the AL West Championship, Beltré batted .448 with 2 HRs and 13 RBIs. He also went 2-4 with a HR in the final game of the season to help the Rangers advance to their sixth AL West title. Beltré finished the season with 18 home runs, 83 RBIs, 163 hits, and a .287 BA. On August 3rd, 2015, Adrian hit for the cycle with hits in the 1st, 2nd, 3rd, and 5th innings against the Houston Astros at Rangers Ballpark in a 12-9 win. It was his 3rd cycle in his career and the 2nd as a Ranger. All of his cycles have come in Arlington (the first time as a visiting player for the Seattle Mariners). Only three other players (Long John Reilly, Bob Meusel and Babe Herman) have hit for the cycle three times in a career; Beltré was the first to do this in 82 years. In February 2015, the Rangers picked up Beltré's option, which would have become guaranteed if he had reached 586 plate appearances in the 2015 season. Beltré finished the 2014 season batting .324, his highest average since 2004, with 19 home runs, and 77 RBI's in 148 games. On September 18, Beltré hit a single off of Sonny Gray in the 1st inning to get his 2,591st hit, surpassing Vladimir Guerrero as the all time hit leader among Dominican players. On June 24, 2014, Adrián hit a single off Drew Smyly of the Detroit Tigers for his 2,500th career hit. It was Beltré's first hit in a 4-for-4 game. On May 7, 2014, Beltré hit his 100th home run as a member of the Rangers, becoming only the 5th player in Major League History to hit 100 home runs with 3 different teams. He joined Darrell Evans, Reggie Jackson, Alex Rodriguez, and Jim Thome. On August 5, 2013 Beltré was named the American League Player of the Month for July 2013, his third such honor with the Rangers. Beltre batted .369 with four doubles, nine homers, 19 RBIs and 13 runs scored over 26 games. He tied Alfonso Soriano for the Major League lead in homers and tied with Torii Hunter for the MLB lead in total bases (69). Beltre also finished among the AL leaders in slugging percentage (second, .670), hits (tied for second, 38), extra-base hits (tied for fourth, 13), RBIs (tied for fifth) and batting average (sixth). Just for good measure, Beltré capped off his award-winning month in style, blasting a walk-off homer to lead the Rangers past the Angels on July 31. 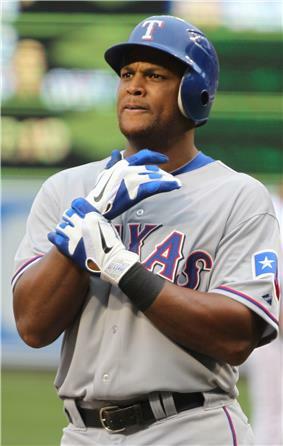 Beltré has received AL Player of the Month honors four times, most recently with the Rangers in September 2012. He is one of seven players to win the monthly award multiple times with Texas, joining Josh Hamilton (four), Rafael Palmeiro, Alex Rodriguez (three each), Ivan Rodriguez, Juan Gonzalez and Ruben Sierra (two apiece). On July 8, 2013, Beltré was named the American League Player of the Week for July 1–7. Beltré batted .478 (11-for-23) with 4 homers, 2 doubles and 5 RBI in 6 games last week. He led the American League in home runs, slugging (1.087), OPS (1.607), total bases (25), and extra-base hits (6) while producing the fourth highest batting average. Beltré hit safely in all six games with two or more hits four times. He had the 24th multi-homer game of his career with a pair of long balls on July 4, 2013 against Seattle. On October 30, 2012 Beltré was honored with the Gold Glove Award for the 2012 season.